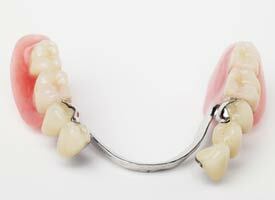 A removable partial denture is designed specifically to meet the needs of the patient and can replace one or more missing teeth. Natural appearance and speech clarity are restored, as is the ability to eat more efficiently. Maribel Caudillo, DDS will design your partial denture so that the chewing forces are evenly distributed over the entire surface of the remaining teeth and soft tissues. Changes to your remaining teeth may be recommended to help equalize these forces. Metal partials are generally preferred as they are structurally superior. They are thinner and more hygienic than an acrylic partial. Acrylic partials are typically used as a transitional or temporary partial. Maribel Caudillo, DDS will consult with you to determine the appropriate partial for your situation. To learn more about partial dentures and whether they may be right for you, use the form below to contact us today. Inspired Dental is your Papillion Dentist!